Welcome to the Mary Mahoney Professional Nurses Organization. Our historic mission is to provide financial aid and scholarships to students of African heritage who pursue studies leading to careers in professional nursing. Read about the MMPNO goals here. Individual Registration for the 70th Annual Scholarship Luncheon is now full. If you have any questions please call Mary Mahoney Professional Nurses Organization number at (206) 632-2524. Please leave your name and contact number so that we can return your call, thank you. Donate to Mary Mahoney here! 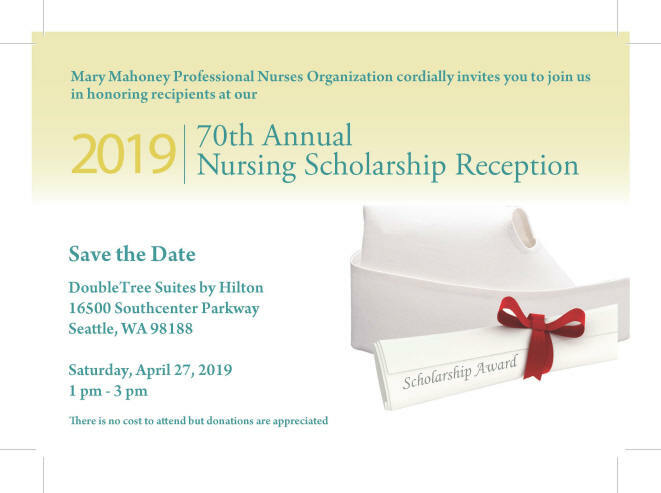 Mary Mahoney Professional Nurses Organization was first founded in 1949 by Anne Foy Baker and twelve other Seattle nurses. The organization was first named the Mary Mahoney Registered Nurse Club. Ms. Baker invited twelve registered nurses to a meeting in her home to meet one another and discuss an idea of establishing a professional organization. Under her leadership, the organization was created with a two-fold mission: First to provide information and support for each other and the community; and secondly, to provide scholarship support to students pursuing education and careers in nursing. Annually, the Anne Foy Baker Award is presented to an outstanding community member who reflects our value of community service, another mission of Mary Mahoney Professional Nurses Organization. Ms. Baker believed that Nursing was a “calling to serve” similar to the call to become a minister. She believed we have an obligation to provide service to our community and those who are committed to our care, a belief she demonstrated throughout her life work. Her life and her legacy are celebrated by the Anne Foy Baker Award named in her honor.